Jeff Jarka and Jim Amash The Ren & Stimpy Show #38 Splash Activity Page "What's Wrong with This Picture?" Original Art (Marvel, 1996). There are seven things wrong with this picture! Can you find them all? 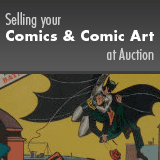 The art has an image area of 10" x 15" and it is in Excellent condition. Signed by Jeff Jarka at the lower right. Includes two copies of The Ren & Stimpy Show #38.